“All who are under the training of God need the quiet hour for communion with their own hearts, with nature, and with God…We must individually hear Him speaking to the heart. When every other voice is hushed, and in quietness we wait before Him, the silence of the soul makes more distinct the voice of God. He bids us, ‘Be still, and know that I am God.’ This is the effectual preparation for all labor for God. Amidst the hurrying throng, and the strain of life’s intense activities, he who is thus refreshed, will be surrounded with an atmosphere of light and peace. He will receive a new endowment of both physical and mental strength. His life will breathe out a fragrance, and will reveal a divine power that will reach men’s hearts.” The Ministry of Healing, 58. Timothy and Anita at Mt. 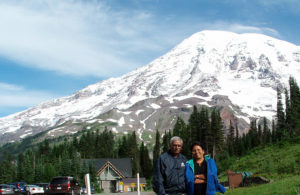 Rainier in Washington. Two years ago, Timothy and I tried to come and visit our daughter and her family, who live in the US. However, for some reason we were not granted visas. We were very disappointed, as we so much wanted to see the new addition to the family, our little granddaughter, Danielle. This longing grew even stronger as we learned that Danielle had special needs and we wanted so much to be of moral support and encouragement to the family. Our cry and wrestling with the Lord did not fall on deaf ears; when we reapplied for visas in April our Lord wonderfully opened the way. We began wondering who would take care of the school matters and the children at Green Pastures while we were away. Here too, the Lord provided a humble worker who has been faithfully doing his duty at Green Pastures these last few months. We believe that angels guard our properties and take care of the little ones in their going out and coming in. As we realize, we could not have watched over them over these many years without their help. Especially since we live in a wilderness type of environment with serpents and other nocturnal creatures that abound in such habitats. The children always sing Scripture songs while they work, play and travel between school and their boarding place (boy’s dormitory). We can safely say, that angels have been their buckler and Psalm 91:10-13 is very real to us all. 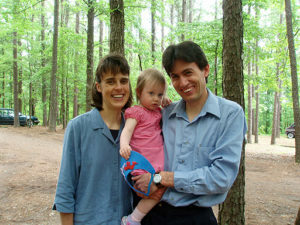 Anita (far right) with her daughter, son-in-law and granddaughter. We have been fortunate to experience, spring, summer and a little of the fall weather here in the US. Our travels these past months have taken us from the East Coast (Washington D.C.) right up to the West Coast (Washington State). It is with grateful and thankful hearts that we praise our Savior for His manifold blessings that He showered upon us in all our journeys. Our Lord, even fulfilled our great desire to attend holy convocations and be a part of His great family of the Seventh-day Adventist faith. At these gatherings we learned that the need of the hour is to develop Christ-like faith and characters to be fitted for Heaven. We also saw the great urgency of finishing the work that was commissioned to us by our Savior so He can return to take us home. We enjoyed sacred communion and fellowship one with another and joined in songs of joy and gladness lifted up in praise by young and old alike. We even got to work behind the scenes and help prepare vegan food and do chores and feel the heart beat at camp meetings. But most of all, we humbly knelt at Jesus’ feet so He could teach us how to be more like Him and not yield to the devil. We understood perfectly what Jesus was trying to tell Martha when He said Mary had chosen the better part of sitting at His feet, rather than rushing around trying to impress people with how busy she was and how her work was not acknowledged. We know that when we are in His Majesty’s service it is easy to feel that we need to be doing things so as to be justified that we are His servants, but then we forget that Jesus longs for us to spend time with Him. This He prefers more than all the bustling activity for Him. It is quality time that the Lord wants from us so that He can empower us to serve Him better. This is the greatest blessing we learned to enjoy while being in the US. Oh, how He longs for us to give Him our undivided attention, while we pray, or read His Word or communicate His love to those in need of it. While we visited in homes where the hearth of Christian fellowship burns consistently and steadily, we learned how fragile we are in a world where the pull is toward evil. We saw homes where the family altar was made supreme morning and evening, to safeguard young feet from straying, and bowed to the dear Lord to keep parents looking up to Him for help at all times. 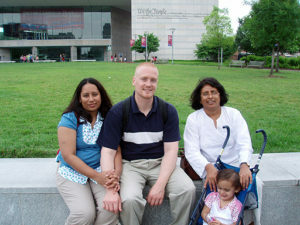 Mandy, Karise and Cody Francis—one of the families that hosted the Tharasingh’s during their visit to the United States. We experienced Seventh-day Adventist hospitality that we did not deserve, and saw people open their hearts, homes and purses when the need arose. And at the end of our stay here, we can truly say, that we experienced a little of heaven here on earth. Our focus, once we get back will be to work in renewed strength and earnestness to carry the torch of the Three Angels’ Message and light up the dark corners of India, where blind faith, superstition and prejudice are taking their toll on those who are working to spread the everlasting gospel. We only want to be used and spent by our Lord in the remaining few years that are left on this earth for Him. Our thrust will be on literature evangelism, translations/publications of Spirit of Prophecy writings, translations of Bible (Old and New) and Spirit of Prophecy into different Indian languages in audio, also village outreach with video presentations on the life of Jesus followed by health seminars and cooking classes (vegan/vegetarian). The small school will continue till April and then we plan to concentrate our efforts on training young people so they can work as gospel workers and literature evangelists once they complete their training. At this point, we are waiting on the Lord to send us workers to help with training the children and also provide the necessary funds to be able to employ staff, housing etc. Maintaining the two properties and getting it to be more productive has been a challenge for us in the past and we are hoping that in the future we will be able to do both, the Lord being our Supreme Provider. Please pray for our work and also we need laborers in this part of His great vineyard. Please prayerfully consider how you can be a part of this outreach work. By Timothy and Anita Tharasingh, Green Pastures Project, India. Donations can be sent to SALUTE Ministries – USA, P.O. Box 337, Bismarck, AR 71929-0337. Telephone: 501-865-3974.